I can't decide how I feel about the fact that my thoughts on boys and pictures now has a part 3. Maybe a little sad that it's come to this. Last weekend, as previously mentioned, Jordan and I were in Springfield, IL, for a wedding. 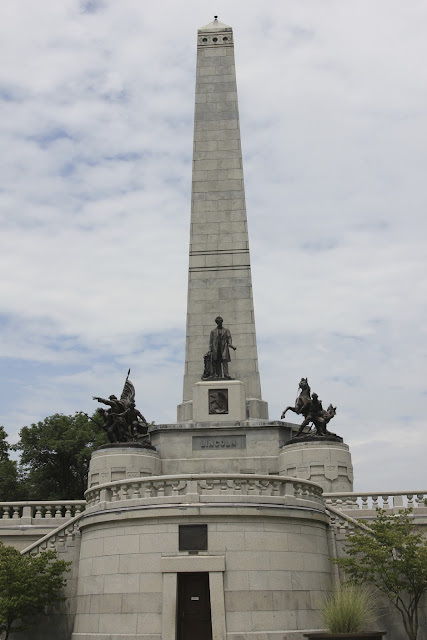 If you don't already know, Springfield is the location of the Abraham Lincoln museum and the place where Abraham Lincoln is buried. Pretty cool, no? Honest Abe. May he rest in peace. 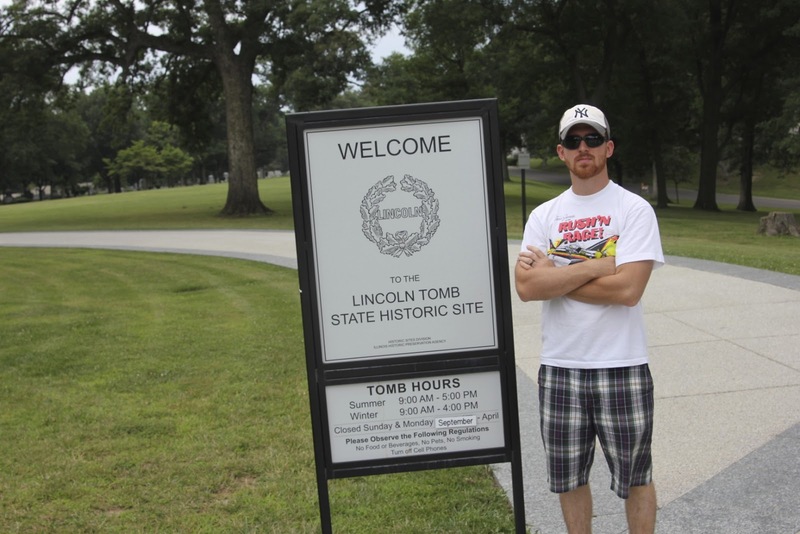 I've been to the museum a few times now, school trips and such, but Jordan had never been, and since he's a huge history buff, I figured he'd appreciate hitting up the Lincoln tourist spots. We went to the museum and then headed over to the graveyard. 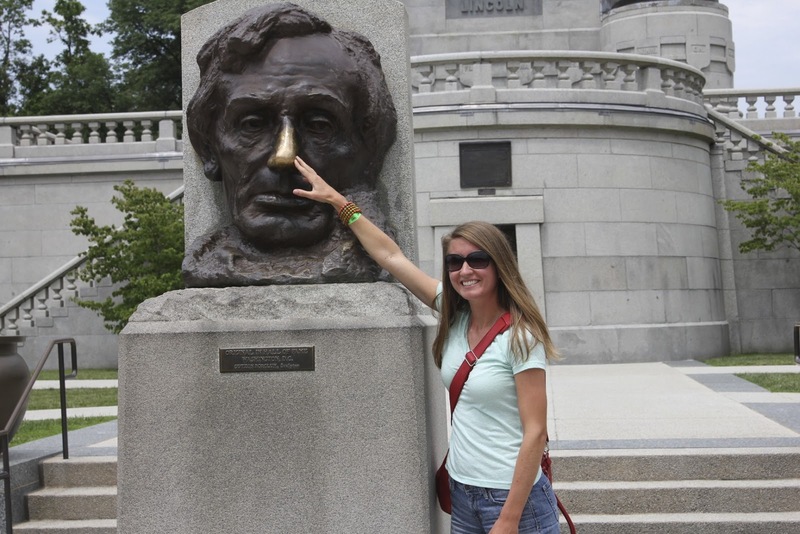 It's hard to miss Lincoln's gravesite. That thing is large and in charge. Do you see me? How I'm smiling? That's how normal people take pictures. After we got home, I was showing Jordan the pictures from our trip, and when he saw this one he said, "That's what I looked like?" "That's weird. I thought I was smiling." Good grief. I have a serious problem on my hands if he honestly thought he was smiling. So again I ask: What is it with boys and pictures? I hope someone else has an answer, because I have no clue. Haha, Riley is the same way. He's more than willing to take my picture, but it's so much harder to get him to pose for one. You should have seen the trouble I had taking a picture of both my dad AND my husband, posing together, this weekend. The most decent one, which I posted, still had Riley making a face. I am so glad someone else has this problem! The number of pictures I have of Adam and his brothers not smiling far outweigh the smiling ones. Adam is terrible at smiling and at our wedding the photographer even said, "are you not happy to be getting married? You've only smiled in a few pictures so far." Ah, boys. Hahaha! I've noticed the exact same thing! Is it so painful to look happy in photos? Why so serious all the time? Bahahahahaha! He thought he was smiling, boys are so funny! I seriously thought they made this face on purpose. Hahaha this cracked me up! I have the opposite problem any time I take a picture of my husband, he makes the goofiest, cheesiest grin he possibly can! Hahaha yes I love that. Michael does the same thing. Such noobs. my in laws are heading there today! I feel ya! Boys are always so difficult when you ask them to take a picture! Haha. Boys are too cool to smile. Mine is the same way!!! Crossed arms, scruffy beard and frown! I think maybe they spend less time in the mirror, seeing what their face looks like and practicing their smiles, maybe? I love this series! Seriously, what IS it with guys and not smiling? Remember how almost every other boy in the yearbook had to do a tough-guy stare? Not a good look, fellas! HAHA, Jack is the same way. His mouth moves like .2 centimeters into smile formation. PS. Your hair looked fantabulous! I'm sorry, I have no explanation for you. The Fiance is the total opposite when I take pictures of him. He's such a ham, it's all I can do to get a normal expression out of him instead of his favorite "OMS" ("open mouth smile" - that's how cheesy he is in photos...). That first picture is very impressive, and I like the shiny nose! My husband will do obnoxious things like pick his nose or scratch his fanny. Cute, right? He's a lovely example for the children. Haha! My Dad and brother do the same thing! seriously my husband can not take a decent photo because either he just wants to be goofy behind the camera or he looks not pleased with me because he is thinking not another photo didn't we take enough of these already? P.S. I tagged you in a game on my blog!